Best Window Alarms: Are you looking for window alarms? We have made a list of the best window alarms. Because it has been statistically proven that a home or an office without a full-fledged security system is 30 percent more vulnerable to thefts and break-ins. This has led to increased awareness about home safety and security. This has also led to an increase in sales in the best window alarms. Such window alarms provide complete protection from break-ins and burglaries. Some extra window alarms can be programmed so that any person who is sleepwalking will be prevented from coming to any harm. Electronic security systems with a window alarm will also protect you from accidental fires. This list will take you to the window alarms buying guides. The pros and cons of each device have also been included. This list has been devised keeping in mind the usability, an inbuilt DIY nature if applicable, the ease of use, value for money, and the features that are present. A detailed description follows each of the product as well as the pros and the cons. How loud the alarm is can also be a criterion: you do not need an alarm which emits a low or a tinny noise which will not even wake you up. Manufactured by GE, this device combines the best of both worlds: it combines professional security systems with DIY standards. In fact, this Personal Security alarm is at the top of the list due to its ease of use. It is very small (5 x 4.5 x 1.2 inches) and easy to install: essentially a stick-on product, it has an adhesive backed Velcro rear for ensuring it sticks to windows or wherever else you want them. This alarm also abides by the rules set out by the NFPA. The alarm is very loud, which is good. 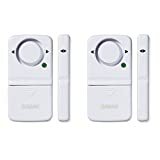 It features two 120-decibel window and door alarms; each of them has three adjustable settings, which are off, set to chime, and the standard alarm. Ideally, we like to keep the device in the alarm mode as it is louder. It is easy to toggle through the three settings. Besides, the chime feature serves more as a notification feature than an actual alarm; the alarm will continue to sound as long as the window is ajar. The alarm is also good enough to scare off any would-be intruders. The alarm is totally baby-proof and fits snugly on older doors and windows in older houses where the windows may not fit absolutely properly. GE has ensured that this alarm can also be installed on sliding windows. For the price, this home window alarm is a great buy. Small size and very little weight help installation even when done at a height. Adjustable chime and alarm modes helpful when installing in a home with multiple floors. Stick-on installation is a no-brainer. Very discreet and very modern in appearance. No volume control; the chime option can be quite shrill. Extra batteries for alarms (LR44 type) is installed; buying spare batteries can be slightly difficult. When the two pieces of the alarm are put back together, the sound goes off. We do not especially like this feature. Buton Batteries can be choking hazards for kids. One great feature that the Doberman Security device offers is that it offers vibration detection; if someone tries to pry open the window or smash the glass, the alarm will be set off. This is a very slimly manufactured window alarm and weighs a mere 3.2 ounces. As far as the dimensions are concerned, they are 2.8 x 0.3 x 2.8 inches. The item also comes with a pretty loud 100 DB alarm which will prevent any intruder. The device is extremely DIY-friendly and is noted for the brand name Doberman that has recently gained in popularity. To install, simply peel and stick the device; no extra tools are needed. Onboard is a vibration trigger technology, which is present to ensure that the alarm is not triggered by rain or wind and thus preventing any false alarms. Being ultra slim in design, the window alarm is also ideal for use in small flats and on RVs. To put things into perspective, the device is about the size of your palm. Once triggered, the alarm will sound for 60 seconds and then the device will return to the active status. Excellent sensitivity and loud alarm. The native vibration trigger technology is actually pretty neat, which makes it a great product. Very sleekly built, does the job perfectly. Easy to install; simply peel and then stick. Does not work on patio-style french doors, which is a negative. The sensitivity that is an advantage can also be a negative point; some users have complained that their pets have triggered the alarm. This remotely operable anti-theft window alarm is a great device which weighs a mere 3 ounces and which is magnetically triggered whenever the windows are lifted by a certain pre-set point. The main advantage of this window alarm is that it comes with a remote control and can be readjusted from any part of a home. You can also set the alarm and arm or disarm it using the remote control. This alarm will work on doors and sliding windows as well. There is a double-sided adhesive on both the Alarm and Magnet compartments which are to be simply peeled and stuck; make sure that the distance between the two units is not more than 10mm. This alarm also works great for sash windows and is ideal for mobile homes. Weighing in a just 71 gms and with dimensions of 4.2 x 2.5 x 1.5 inch, this device has a handy panic button for emergencies which will set off the loud alarm when activated. It is thus more than just a window alarm. 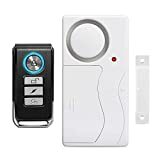 This alarm also has something called a doorbell mode which works even when you are outside the house as a doorbell, activated by the remote control. When used, this mode will disarm the alarm, however. Handy form factor and interesting design. Easy installation procedure; just peel and stick. Batteries are different as far as the alarm unit and the remote control unit (two AAA alkaline batteries for the alarm, one 12V/27A alkaline battery for the latter) are concerned. Logistically tricky issue. By far one of the most popular brands in this list of the best window alarms, the alarm boasts a 120 dB sound which is audible from as far as 750 yards away. This company is known for its law enforcement products and is also ideal for DIY installations. The product has an extra layer of security in the form of the low battery test button as well as a blinking light which indicates a low battery status. Also comes with three modes: off, alarm, and chime, similar to the GE product. Sabre Wireless does not involve the use of a permanent power source as it is entirely battery operated. At just 6.4 ounces, the product is light enough to be stuck on any vertical surface. The dimensions are almost identical to other products at 3.2 x 1 x 5 inches. The most outstanding feature that this product has is that it can be used on patio-style sliding doors as well. Easy to install. Good to look at. Extremely low power consumption; batteries last longer than most comparable products. The sensor can be mounted on either side of the alarm, which is great. Once activated, there is no indicator light to signal which mode it is set in. An added light option would be appreciated. Lacks a contemporary form factor. 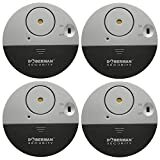 The best magnetically triggered alarm on our list, this alarm will also act as deterrents to your children climbing out of a window thanks to the loud alarm sound which it has. Ideal for use inside homes and offices, the device is DIY friendly and has the peel and stick technology which is common to most of these products. If a burglar tries to pry open or break through a window on which this device is attached, the magnetic switch built inside the sensor trips and triggers the alarms. Magnetically triggered alarms have one great advantage: they are usable on sliding windows and doors, not to mention metal windows. Magnetically triggered alarms also come with frequency stability features. Each unit has four alarms and is thus a value for money product. Use it on multiple windows or other surfaces you want protected. 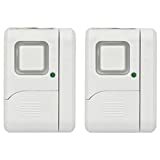 With dimensions of 2x 2x 0.8 inches and a weight of 46 gms each, the LingsFire alarm makes it to our best window alarms list mainly due to the ease of use and trustworthy features. Peel and stick options; zero installation skills required. Fulfills all the basic security features and essentials. One word which the users have in common is that this device is LOUD. That is a plus point for homes with more than one floor. Doesn’t work too well on moist surfaces, mind you. Keeping all aspects in mind, we believe that the best window alarm is the Doberman Security SE-0106-4PK Ultra-Slim Window Alarm. It offers the highest value for money service and is probably the most sensitive alarm there is. Also, it is remarkably free of false alarms and is child-proof. Overall, a solid 10/10. Buying guides are what you should keep in mind when making a purchase decision. Ideally, a lot of original research goes into buying a window alarm. We make the decision simple for you by listing out exactly what criteria for buying you should consider. Sensitivity: Ideally, the window alarm should be extremely sensitive but there is a limit; oversensitivity may lead to your pets tripping the alarm. Nowadays, certain alarm companies have incorporated a new feature to differentiate between humans and quadrupeds. One is a dual-element sensor, where two sets of (invisible) beams have to be tripped simultaneously. This is not possible for the pets and prevents false alarms. The second is creating a pet alley where the sensor is placed much higher than any pet. Wired vs Wireless: Wired window alarms must be hooked up to a power source 24×7 to work. On the other hand, wireless systems run on batteries mostly, which must be replaced on a periodic basis. Choose one that has low power consumption and where the batteries can be easily replaceable. 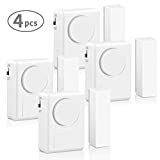 As you have seen, most of these window alarm sets have either the button-shaped LR44 batteries or AAA alkaline batteries. Such batteries can be bought over the Internet or even at your pet Home Depot store. Remote Controlled vs Manual Control vs Both: By far, an alarm which can be remotely controlled is recommended. That said, it is also true that remote controls can be misplaced and there might not be any physical buttons onboard. Thus, choose a window alarm that has both a remote control operator as well as a physical keypad. Ease of use: Any sort of home security related product must be extremely easy to use and open to DIY hacks. Most modern home alarms are peel and stick models meaning that they have an adhesive tape on the rear which has to be peeled off; the alarm sensor can then be stuck on any surface, and will not necessarily be restricted to windows. They must also be adaptable to be taken off whenever not in use. Also, they must be usable on RVs. Discreet: Alarms are, by their very nature, discreet. So, the windows alarms must not be too visible, so that no one outside your immediate family knows where the alarm is located and the model that is installed. Certified Quality: Home and window alarms must be able to withstand a lot of government-mandated tests which will certify their quality. In the USA, for example, the device must be certified by the American National Standards Institute and the SIAC standards. In case you are not installing the alarm yourself, the installers should be certified by The National Burglar & Fire Alarm Association or by the respective state. Monitored vs Non-Monitored: A monitored alarm system is a lot more expensive and a lot more elaborate. It is hooked up to the local police sensors and will issue a siren wailing sound and may also flash the external lights in case a break-in has occurred. Such a setup is professionally managed and must be periodically subjected to certifications and inspections. On the other hand, a non-monitored system such as those on our list are fit-it-and-forget-it models. They are easy to set up and maintain. This is a choice best made by the user. Price: A word on the price is necessary here. Some of the items that you see on this list may be extremely costly; they will also be the most feature-filled. The brand is also something to consider. But the price and /or the brand should not be the only criteria; you should judge for yourself which one is the best for you. Lastly, a standard home window alarm setup should also have 24/7 power backup wherever applicable. This is an absolute must-have. If the lights go out, the alarm will be as good as dead. Thus we come to the end of this list of the best window alarms. While choosing a window alarm, make sure that you read the complete features list of each of the device and not be influenced only by the price tag. We will continuously keep on updating this list for you.